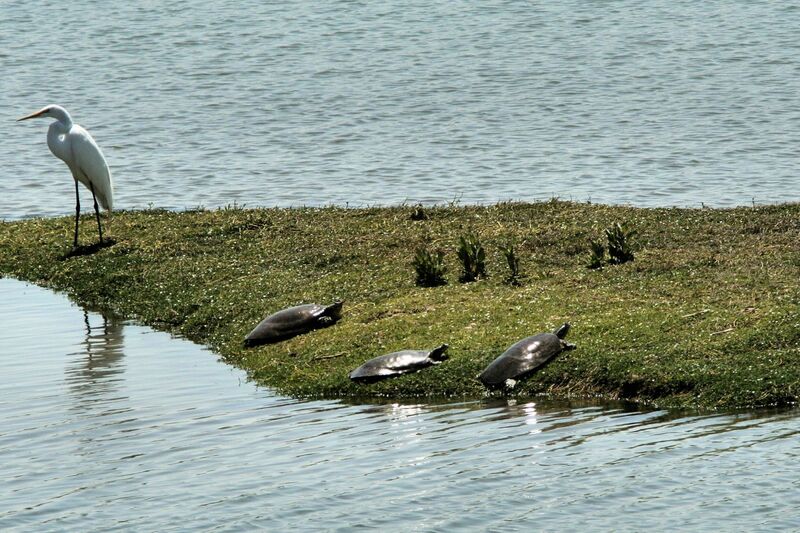 In the Desert, Tortoises, Turtles, Desert Tortoise, Reptiles, Soft Shell Turtle. There are some things you need to know about a Desert Tortoise in the desert, really important things. These reptiles get really big, this one probably weighed in at over 6 or 7 lbs. DON'T ever touch or pick one up. Here's why: Sometimes they can't get any water for over a year and yet they survive by not urinating -- keeping bodily fluids. A matter of life and death. Please be careful if you find a Desert Tortoise and whatever you do don't stress them. Hope you get to see and photograph one. 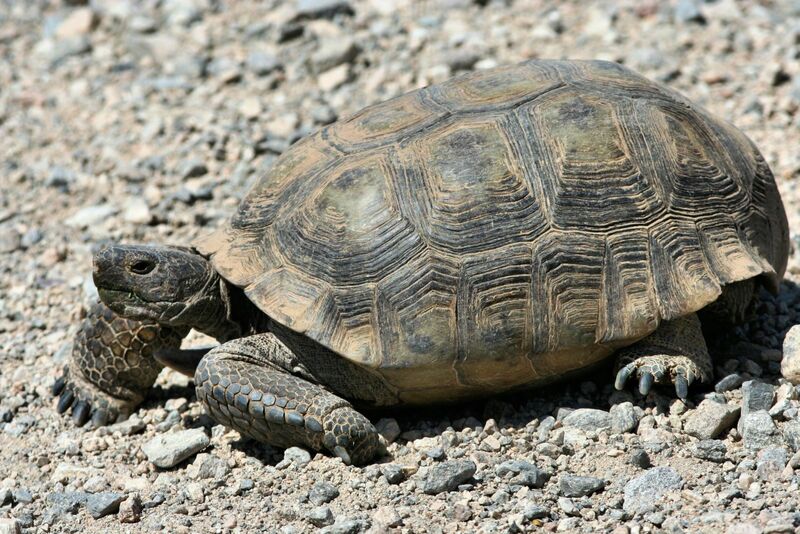 This is also a female Desert Tortoise. When they are not real young, like this one, you can tell their gender by looking at the "gular", see above. As with most animals you can often tell gender by looks. This Desert Tortoise looks like a female. But you can also be fooled, hope this helps a little. See the enlargement. Even though there are thousands of Soft Shell Turtles now living in the Colorado and Gila River they are considered an invasive species. Government agencies have a lot of time and resources killing hundreds, if not thousands of these turtles without any noticeable reduction in populations. You can still see hundreds of them along the Colorado River in the south in Yuma County. Here's what to look for, see the enlargement. When too many people are standing around talking, yelling, and taking photos you can stress a Desert Tortoise. Picking them up, for any reason, can really stress them. Doing so could cause them to urinate. It won't seem like a big deal to you when this happens, but it might mean the death of the tortoise. In most states it's against the law to pick them up or physically handle them. Please consider the animal and what they have to do to survive. "Gender" Male and Female. How to tell without bothering or stressing the animal. The Female has a much smaller tail than the male, This may not help but there are other ways to tell. For example there is a bony plate below their head (shown here -- above and below) which often times will tell you the gender. The one above is a male and has a cupped shape and the bone "gular" is often longer on the male. The female below has a shorter "gular" and it is actually forked. She is younger than the male shown above. It is often hard to tell the gender. In some cases you may be able to tell their gender. One other thing, during mating season the male will get two sacks just below either side of his jaw that will bulge out somewhat. Now one other important thing you'll probably run into (hopefully you won't). 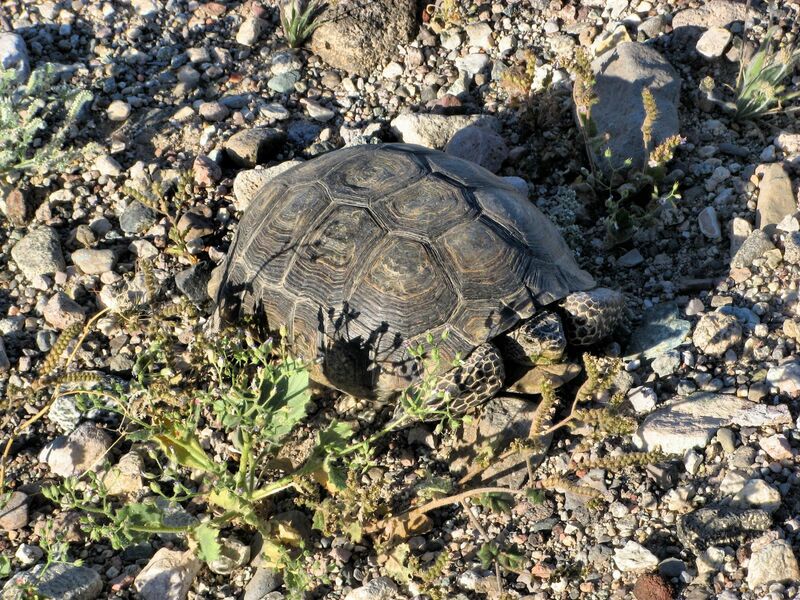 Often we've seen them in gravel roads and they will look like a rock laying in the road, Many get killed because of this, so be careful and make sure it is a rock and not a Desert Tortoise.